Family photos, while dearly loved, often find themselves hidden in envelopes, or tucked away in drawers. One way to showcase these loose pictures is to bring them into Framagraphic to have them drymounted on foam board. This will give them a strong backing, but one that is soft enough to pierce through with a needle or pin. A ribbon can then be pulled through the holes, and knotted at either end. 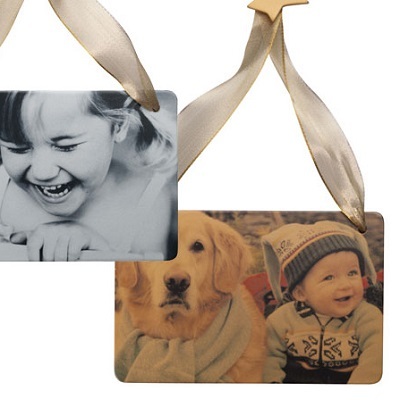 For a matted ornament, we could make a boarder around the picture. Almost a miniature frame, the mat would protect the picture slightly more, and you would not need to pierce a hole directly though the picture. This easy DIY ornament can be placed upon a branch, over a mantle, or even on a key holder. After the holidays, when the ornaments come down, they don’t need to go back in the box. Take in your crafts, and Framagraphic would be happy to help you pick a custom frame ideal for showcasing those pictures throughout the year.